On April 23, 1827, Canada Company agent, novelist and colonizer, John Galt founded the town of Guelph on the banks of the Speed River. Galt named the town, Guelph, in honour of the British royal family. When Guelph was founded, the Parish and Town Officers Act of 1793 formed the basis of municipal government until 1841. There were three levels of municipal government and administration. The district was the largest and most important unit of municipal and judicial administration. Counties, created in 1792 by Lieutenant John Graves Simcoe, were sub-sections of districts and were used as provincial electoral and militia administration units. The smallest municipal unit was the township. It served as the basis for land surveys and local appointments. Counties were intended to unite the functions of the district, but their creation was met with considerable opposition from entrenched district officials. As a result, Simcoe established counties as subsections of the districts to carry out limited functions of electoral and militia units. Originally, Guelph formed part of the Gore District, the district seat of which was in Hamilton. Frequent complaints about the distance to be traveled for legal matters and the inattention to local affairs provided impetus for the formation a new district. Given the heated political climate of 1837, the provincial legislature decided to divide the Gore District into the counties of Wellington, Waterloo, Grey, and Bruce. The legislation provided for the creation of the Wellington District with Guelph as the county seat, provided a jail and courthouse be erected. When the jail was completed in 1840, the new District of Wellington officially came into being and Guelph became the county seat. Court was held in the local hotels until the new courthouse was completed in 1843. Offices of the Wellington District were also located in the courthouse building. In 1849, the provincial legislature passed the Baldwin Municipal Act, which abolished districts and transferred local government power to the township and town level. At the time the Act was passed, Guelph, along with several other settlements, was a village and had not obtained the required population of 3000 and facilities to petition for status as a town under the Act. Yet, Guelph was a district seat with a court. To remedy this situation, Guelph was separated from Guelph Township and given the honourary title of town, but none of its powers. However, the list of affected towns was omitted, in error, from the Act's schedule of towns. Guelph had to wait until 1850 and the passage of a second Municipal Act to receive confirmation of its dual status as town and village. When the Town of Guelph was established on January 1, 1851, Guelph remained an incorporated village. The Town of Guelph Council was composed of five annually elected councillors, who selected from amongst themselves a reeve and deputy reeve. The Council was responsible for schools, roads, regulation of inns and taverns, and statute labour and had the right to raise taxes, tolls and borrow money. By 1852, Guelph Town Council, alarmed by the pending loss of its district seat with the creation of the new counties of Waterloo, Grey and Wellington, turned to the politics of railways and road in an attempt to regain trade and income from the outlying townships. Council was successful in obtaining public support for the investment of 10,000 pounds in the Toronto-Guelph Railway Company, which was later bought and absorbed into the Grand Trunk Railway. In 1855, Town Council invested 20,000 pounds in the construction of the Guelph-Galt line of the Great Western Railway. With concern for land speculation and the expansion of settlement on the south side of the Speed River, Council petitioned the Legislature to expand Guelph's boundaries southward, which was done effective Jan. 1, 1855. Between 1853 and 1857, Guelph's population had grown from 2,000 to 4,500. On January 1, 1856, Council's petition for town status was granted under the terms of the Municipal Act. The town was divided into 4 electoral wards, with 3 councillors elected from each ward. Council acquired the additional powers of policing, street lighting and maintenance, regulation of alms and workhouses, regulation and licensing of stables and public conveyances, assessment of real estate taxes for local improvements, imposition of fines and limited jail terms for by-law infractions. After much planning, a new town hall/market house was opened in the fall of 1857 on present day Carden Street. The town hall included a market square with stall for vendors, a courtroom, fire engine house, police lock-ups, Mayor's and Treasurer's offices, Council chamber, and the Farmer and Mechanics' Institute. The original dome was replaced in 1869 and a new hall was added to the building in 1875. In September 2009, the new city hall was opened adjacent to the former city hall building. It was built to meet the LEED Silver Standard in energy and environmental design. Economic growth slowed in 1857 with the collapse of the international economy and end of the Canadian railway boom. Guelph politicians were aware that Guelph's economic base had not grown as rapidly as its population. In order to spur economic growth, the commercial community turned its attention to new market opportunities in manufacturing. During the years 1856-1871, Guelph experienced slow but solid economic and commercial growth based on the expansion of the agricultural economy of south Wellington and the development of newer hinterland settlements to the north of Guelph. During the 1860's new manufacturing enterprises, such as the James Goldie Company, McCrae and Co., the Raymond Sewing Machine Company, and the Bell Organ Company opened and flourished, as Guelph attempted to make itself a thriving market and commercial centre to its agricultural hinterlands. A Board of Trade was established in 1866 to encourage industry and economic growth. The close alignment of commercial leaders and civic politicians was evident in the election of prominent businessmen such as David Allan, W.S.G. Knowles, and H. W. Peterson to Town Council. On April 23, 1879, Town Council's petition for city status was granted under the Municipal Act, as its population had reached 9,918, according to the 1878 assessment. As a City, Guelph became a corporation and was separated from Wellington County. In 1878, Guelph was divided into six electoral and assessment wards. The wards were: St. Patrick's, St. John's, St. George's, St. David's, St. James' and St. Andrew's. Following its designation as a city, Council passed numerous subsidy by-laws between 1880-1899 to help attract and retain industry and businesses in Guelph These subsidy by-laws provided industry with property tax relief and free water for ten years after the establishment of a new business, but also required performance guarantees on the part of the company which included the specification of the number of employees to be retained while receiving the subsidy. In combination with the National Policy of the federal Macdonald government, this subsidy program was successful during the years 1878-1884. According to a 1885 survey, employment in Guelph had doubled from 517 workers in ten industries 1878 to 1,050 in thirteen industries in 1884. However, by 1919, the efficacy of the program was put under scrutiny. The report of the City's Industrial Department showed that, since 1910, a total of sixteen industries had been attracted to Guelph, but by 1919, ten of the sixteen industries assisted by the City's subsidy program were out of business or no longer in Guelph. With the existence of the Canadian Pacific Railway (CPR) line sixteen miles away, town leaders saw the need to create a spur line to connect Guelph with the CPR. In 1884, Council authorized the creation of the Guelph Junction Railway (GJR) with the investment of $170,000. The mayor sat on the GJR Board as vice-president and represented the city's interests in dealing with the railways. The GJR spur line and facilities were leased to the CPR for ninety-nine years in 1888. With the extension of the Guelph-Goderich railway line, the GJR turned into a prosperous venture. The provision of a clean and safe water supply for Guelph residents and industry was a concern to Council in the late 1870's, as was the devastation wreaked by numerous fires in the City's downtown. The Guelph Waterworks Act of 1879 provided for the establishment of a three person elected commission to manage the City's waterworks. The City's waterworks, composed of a well, reservoir, hydrants and water mains were completed in 1879. A sewerage system, including a disposal plant, was added in 1903. A Water Commission, established under by-law in 1907, oversaw the pumping and distribution of spring water from Arkell into Guelph. A grand opening of the waterworks system was held in September of 1909. In 1903, following the formation of the Hydro-Electric Power Commission of Ontario (later known as Ontario Hydro), the City of Guelph purchased the Guelph Light and Power Company, formerly the Guelph Gas Company, which supplied and distributed the City's gas and electrical power for $155,000. This initiative signalled Guelph's pioneering move into municipal ownership of public utilities. The Fire, Light and Water Committee managed the gas portion of the business for the first three years. The gas division was then sold to Union Gas in 1957. The Board of Light and Heat Commissioners, which included the mayor, managed the electrical division of Guelph Light and Power starting in 1907. In 1908, Guelph agreed to take Niagara Power from the Hydro-Electric Commission of Ontario. In 1967, the Board of Light and Heat Commissioners changed its operating name to Guelph Hydro. In 2000, the utility was incorporated and divided into four companies, one holding company and three subsidiaries: Guelph Hydro Electric Systems Inc. (distribution), Selectpower Inc. (retail energy and energy services), and Fibrewired (fibre optics). The purchase of the street railway in 1903 by the City of Guelph added another layer to the growing list of municipal services and utilities managed by the City. The Guelph Radial Railway Company operated within and beyond city limits. The residents of Guelph remained dependent upon a volunteer fire brigade until a permanent full-time Chief was hired in 1909 and the nucleus of a paid brigade was formed. Until the 1920's, the City of Guelph followed a council system of government, in which the mayor and aldermen were elected annually. The mayor was elected at-large, while the aldermen were elected by wards. Committees, composed of aldermen, directed departments. With the rise of the Progressive movement in the 1920's and growing public ownership of utilities, Guelph Council saw the need to adopt a "city as a business" model, and a commission style of local government. Under this proposal, a city manager would oversee the coordination of all boards, committees and commissions. The move to a commission government was perceived as a means to attract skilled administrators to manage local government departments and functions. However, Guelph was unable to get the approval of the provincial legislature for commission management of all their utilities and used a mix of commission and committee management of departments and functions. In 1906, Council received ratepayer ratification for the establishment of two separate elected commissions to manage the power utility and the waterworks. By the 1910 election, the election of aldermen again reverted to an at-large system. The commission government experiment started to falter with the lack of accounting, labour and legal services coordination between the commissions. By 1912-1915, there was a noticeable retreat from government reform. The City Clerk acted as the City Manager, coordinating the activities of committees and commissions. Council then divided the job duties of Clerk and City Manager, but abolished the City Manager position in 1925, and returned control of various civic departments to standing committees of Council. The Council's short-lived experiment with municipal reform ended with a return the Council-committee system of government. In terms of electoral practice, Guelph went through a period of flux from 1903 to 1930, mirroring the uncertain economic times and the brief experiments with municipal organizational reform. From 1856 to 1902, Guelph ratepayers elected three aldermen for each ward for a one-year term of Council. In 1903, to 1906, ratepayers voted to elect eleven aldermen by general vote. Pursuant to a vote of ratepayers at the 1906 election, it was decided to return to the system of election, in which three aldermen were elected from each ward. The system then reverted back to an eleven aldermen slate elected by general vote during the years 1910 to 1918. In the years 1919 to 1923, Council consisted of eighteen aldermen elected by general vote. However, provincial legislation provided that the six aldermen obtaining the highest number of votes held office for a three-year term, the six who obtained the next highest vote held office for two years, and the next six who received the next highest number of votes held office for a year. In each year thereafter, one-third of eighteen aldermen were elected for a three-year term. Annually, Council elected one of its members as mayor. In 1923, provincial legislation permitted that Council consisted of a mayor and eighteen aldermen, but that the mayor was to be elected annually by general vote of the electors. The three-year term of aldermen was reduced to one year and the number of aldermen was reduced to eleven for the 1930 election. In 1966, voters elected eleven aldermen for two-year terms by general vote. In 1983, the term of office was changed to three-years and in 1992 the election of two aldermen by ward began and continues in 2002. The return to ward based elections meant that Guelph had come full circle in terms electoral practice. In order to accommodate its growing population and industrial expansion, Guelph annexed 2500 acres from neighbouring Guelph Township in 1953. An additional annexation in 1966 from Guelph and Puslinch Townships added 5605 acres to City limits. Despite the move toward regional government in the late 1960's and early 1970's, Guelph and Wellington County remained untouched by municipal restructuring. In 2002, Guelph remains a separated city, which does not form part of Wellington County government. Previous to 1967, the city was organized on the Council-Committee system of local government. Since that time, the Council-Administrator plan has been in effect. Under this system of government, Council operates the City functions, primarily through legislation and the formulation of policy and delegates the carrying out of policy and daily operations to their administrative staff through the City Administrator. The Directors associated with the City Administrator are: Information Services, Finance, Works, Planning and Business Development, Community Services; Personnel and the City Solicitor. In 2002, there are three standing committees of Council- Finance and Administration, Community Services, and Planning Works and Environment. Finance and Administration are responsible for the budget, business development, audits, policy, general administration and human resources. The Committee Services Committee mandate includes recreation, grants, cultural, external liaison, and Social Services. Advisory committees and boards reporting to Community Services include Civic Centre Board, Sports Hall of Fame, Safe City and Sports Advisory Committees. Planning Works and Environment is responsible for Public Works, Transit, Environment, property, protection and planning policy. Advisory committees such as the Green Plan Steering Committee, Environmental Advisory Committee, River Systems Advisory Committee and Cycling Committee report to Council via the Planning Works and Environment Committee. The custodial history of the records, prior to their transfer to the Guelph Public Library archives, is not known or documented. For most records, the exact date of transfer to the archives is not known or documented. See sous fonds and series description for more information. Fonds consists of the records created, accumulated and maintained by the Corporation of the City of Guelph, its Council, committees and departments in the course of providing legislative governance and services to the citizens of Guelph. Included in this fonds are minute books, reports, correspondence, and tax and assessment rolls. 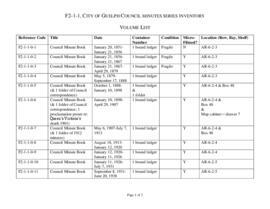 These records document the activities of the Corporation of the City of Guelph. The fonds is divided into twelve sous fonds. The sous fonds have been created based on the functional nature and organizational structure of the Corporation of the City of Guelph. Access to some of the records in this fonds is restricted. See sous fonds descriptions for more information. See sous fonds descriptions for more details on available listings for these records.